Deaf dog: Maggie's owner writes: "Maggie is the cutest JRT in Texas! We would like to someday compete in agility and/or flyball. Comment: Julie is looking for help in training. 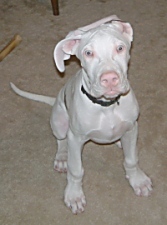 Deaf dog: Bosco is a 4 month old Great Dane. Other pets: Lexi, a 2 year old black female Great Dane.